Excuse me for seeming a little confused here, but hasn't the Prime Minister just been telling us how little money we have and that we're all going to have to tighten our belts and that Disabled people have to accept benefit cuts to the tune of 12 billion pounds ...?! So, what's with this sudden appearance of seven billion that is going to be paid into the Irish banks as a token of the "particular economic relationship" that exists? I suppose the key word here is 'economic'. This government has convinced itself that we are in effect 'useless eaters' and a terrible burden upon society - especially as most of us are supposed to be fiddling the system anyway - and that we are therefore far from being an economical asset! You don't have to read between the lines any more. The ConDems are writing it large that unless we can contribute in a meaningful way (and for meaningful read productive) then we are a burden to their big society. You can almost hear the jackboots marching down Whitehall can't you! So, perhaps we should invaded the Isle of Wight, set up an independent Cripdom, max out all of our credit cards, borrow even more money, and then we can ask the government for a nice big payout to get ourselves out of the red?! Leading the recent protest rally against the proposed Government welfare cuts were a large group of Disabled people. Wearing and carrying large black triangles, they were symbolizing the murder of thousands of Disabled people during the Holocaust; their aim being to embarrass Cameron and his government, who have repeatedly insisted that the most vulnerable will be protected from the impact of the cuts. 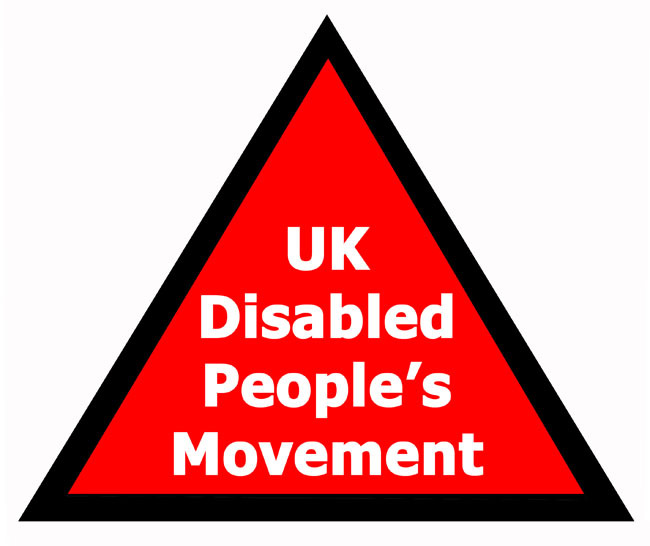 The use of this black triangle seems to have had an impact upon the general public, journalists and other non-disabled people at the protest which indicates that we may have found a symbol with which to carry our fight on into the future. By re-owning the Black Triangle, it could become 'the' symbol of the Disabled People's Movement, a rallying cry for us all and something which articulates our demands in a more direct and recognizable manner. Such a simple yet powerful symbol could be the very thing that we need to bring together the disabled artists, the mental health system survivors, people with HIV and AIDS, and the Deaf communities with all of the other Disabled people in the UK. This is something that we have struggled to do until now, and the powers that be have capitalized on divisions, continue to try to separate us into impairment groups and ensuring that we just fight our individual corner. Large corporations pay huge sums of money to image consultants and publicity specialists to come up with a symbol that the public recognizes and associates with just their company. Imagine just having to portray a Black Triangle in order for people to understand that it represents Disabled people who are working and fighting together for a just and accessible society united under the Social Model understanding and not part of the oppressive Medical or Charitable Model status quo. I’m reminded of the immense power of the red ribbon cross adopted in support of those living with HIV and AIDS, and more recently the pink ribbon symbol which prompts us to think of those we love who live with breast cancer and those we have lost to that disease. Envisage an MP opening an envelope in the future and a Black Triangle falls out. That is all we would need to do ... the symbolism alone would mean that we are watching him or her and expecting them to support our corner in an upcoming debate or vote. The Black Triangle could become the biggest symbol for change since the peace symbol of the 60's! So, how about it, you articulate and feisty Crips out there? Let’s debate these issues and I promise to keep the ball rolling on this blog. Following comments regarding the use of an all black, upwards facing triangle, how about something like this (see illustration). It still retains the triangle shape but introduces a vibrant background of red with accessible white lettering depicting what it represents. What do you think ..? Editor - You are invited to scroll down and leave your comments in the space provided below. "I just received a furious message from actor Nabil Shaban, best known to the public for playing Sil in Dr Who. Nabil is better known amongst activists as a ferocious advocate against war and for disability equality, in particular the right to live in equal status to others". This is how Clair Lewis started her journal last week, and follows on ... "Nabil Shaban ACCUSES the British media, and that includes the BBC, of pursuing an identical propaganda exercise as Doctor Josef Goebbels with his notorious pro-Mercy Killing movie 'I Accuse' ". Nabil goes on to say that, as history has shown, this was preparation for public acceptance of State-sanctioned euthanasia. He adds: "Ray Gosling was not brave, he is a murderer and by bragging about it on air, he is putting disabled people and ill people's lives at risk." An email is also circulating regarding a meeting to mobilise further the campaign for assisted living. Recipients included Baroness Jane Campbell and other leading lights of the disabled people's movement. 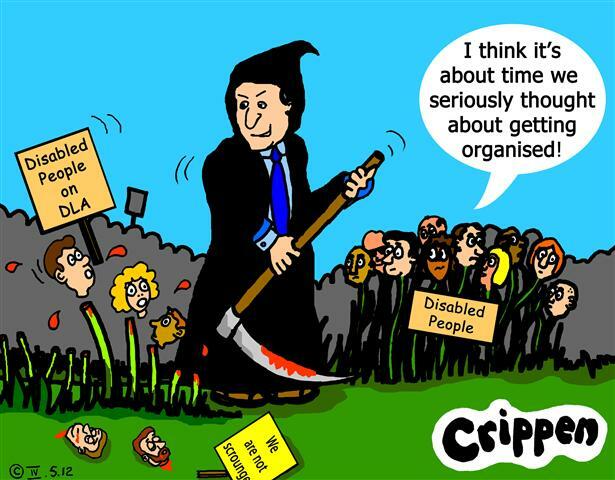 Here is the message it contains from disabled activist Deborah Sowerby: "Some of us disabled activists based in London are trying to mobilise against the increasingly overwhelming clamour for mass 'mercy' killing. Are you aware of anyone planning/doing anything on this? Are you up for a smallish planning meeting in the next couple of weeks? We've been offered a room for free. Look forward to hearing from you." Clair and Nabil have updated Deborah about any activism they know of, as listed in there other blogs and we all have her permission to share this query further. Therefore If you know anyone interested please draw attention to this message. And please support this meeting if you can. I'll keep my ear to the ground and post anything I hear regarding developments. Nowadays the focus has shifted to the other end of life. But the arguments are the same - not based on fact, reality or experience but fear and ignorance. Oh, and economics as well. Money. Resources. This clamour for easier (assisted) suicide takes place against a backdrop of economic catastrophe where the cost of assisted living is unaffordable,fact. So, kill the useless eaters, but let's not call it killing. No need.Simply keep going on about the TERRIBLE drain on the public purse and,in the same breath, keep saying how AWFUL it is to be old/disabled/in pain/dependent on others. By constant association (conflation) the two ideas merge. Now we have one problem. Brilliant. We know what the problem is and who to blame. It's a short step to identifying the solution: reduce costs and relieve suffering in one go. Job done. That takes care of the miserable old people dribbling on the mat. But how about that sweet little baby gurgling in the crib? What sweet little baby gurgling in the crib?" If you want to get involved or support this meeting please contact Deborah Sowerby direct at deborah@incrediblybusy.net or contact Clair or Nabil through this blog. Thanks. 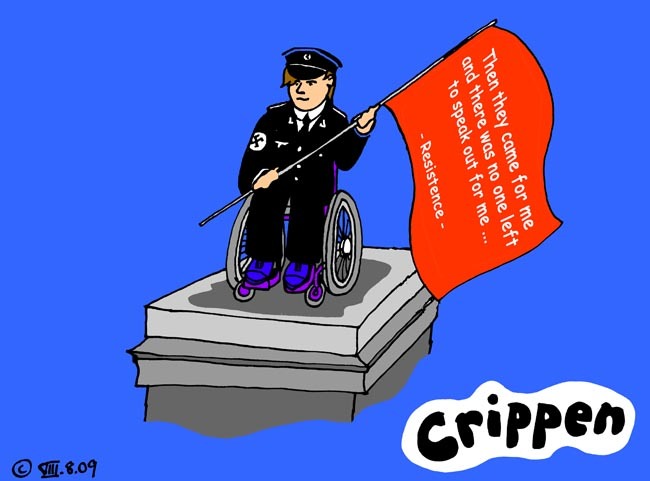 You can access a profile of Crippen on this web site along with other disabled contributers. Unsurprisingly Assisted Suicide is still in the news with another ruling that let a mother who aided her daughter to end her life, walk away from a murder charge. Why the daughter who had ME was 'bed ridden' for over 17 years, was just one of the issues that wasn't addressed during the recent court appearance. 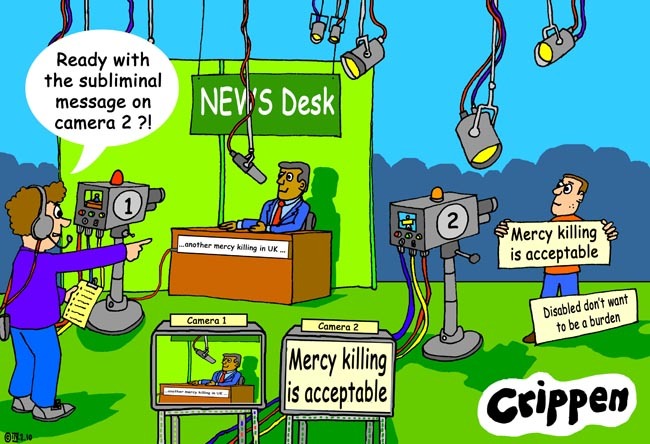 recommended the setting up of tribunals to decide who should 'qualify' for this method of ending their life. For many Disabled people, the ease with which public opinion and now the law is sliding towards a society in which assisted suicide is the norm has serious implications with regard to our standing as viable members of the community. 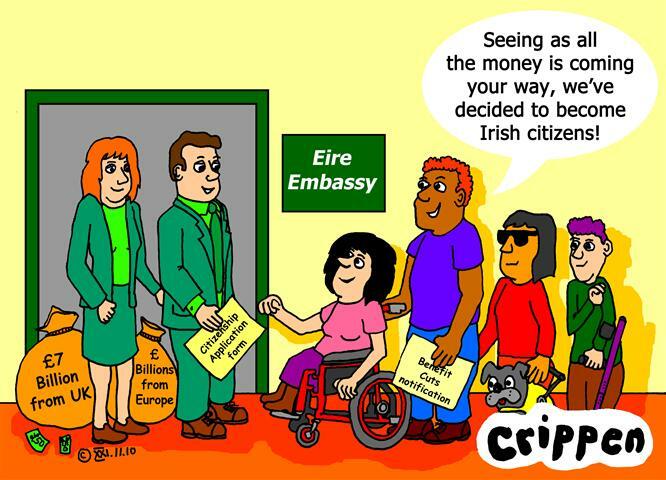 It was only seventy years ago that Germany passed similiar laws which resulted in the T4 programme and the extermination of hundreds of thousands of disabled people. What next, we ask? Laws for the forced sterilization of disabled people similiar to that which were implimented in the United States. Between 1907 and 1939. More than 30,000 people in twenty-nine states were sterilized, many of them unknowingly or against their will, while they were incarcerated in prisons or institutions for the mentally ill.
"But you're taking this out of all proportion" is the response that we are used to hearing when addressing these issues. Try telling that to the 275,000 disabled people who were killed quite 'legally' in Germany during the 1940's. Our mate George has also started a debate on the subject. Click here to join in. Also read Clair Lewis' well written essay on Heresy Corner. Click here for the link. And click here for Jude Stephenson's FaceBook article. Our Disabled sister and fellow artist Liz Crow appeared on the Anthony Gormley plinth in Trafalgar Square on Saturday 8th August at 2200 hrs. And as promised, she presented a dignified but powerful statement against extreme right wing politics in its worse manifestation. Initially clad in a cream coloured blanket that covered her from head to foot, Liz sat quietly in her wheelchair for the first 10 minutes before pulling it away to reveal herself wearing the uniform of the war time Nazi party. At one stage a message was shouted up to Liz from her supporters on the ground: "It's alright Liz, they all get it!" Meaning that the general public, who had been watching understood what her protest had been about. The general public in the area joined in the cheers and applause as Liz was eventually lifted from the plinth after her hour was up and she was able to join the other Danners, friends and supporters at the base. A powerful performance by a strong and courageous woman.